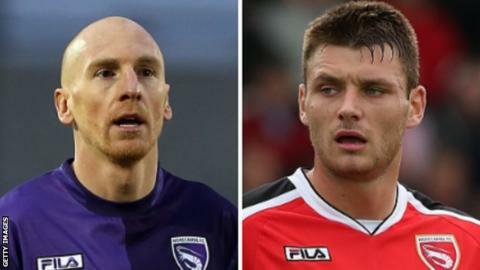 Morecambe's Kevin Ellison and Ryan Edwards have been handed three-match bans after admitting a Football Association charge of violent conduct. The pair were charged following an incident after the Shrimps' loss at home to Wycombe on 18 August. The match officials did not see the event but it was caught on video and reviewed independently. Winger Ellison, 36, and defender Edwards, 21, will miss the Portsmouth, Notts County and Walsall games.